Laser die cutting is the process of using a laser-cutting system to cut and force material into custom shapes and sizes. There are several unique advantages to using laser die cutting over other forms of die cutting, and as such, it’s quickly replacing other, more traditional die-cutting processes. Laser die cutting is energy efficient, and helps to reduce wear as well as the frequency of maintenance required. Laser die cutting also helps to eliminate the storage, lead times, and costs of traditional dies. The machine shop at American Industrial Company features many die building and metal stamping machines, and offers precision metal stamping capabilities that include progressive die stamping, coining or shallow draw stamping, blanking, piercing bending, and forming. From help with design, metal selection, and die design, to help choosing the correct stamping processes, prototyping, and producing products, we here at AIC are available to assist with all our customers’ metal stamping needs. 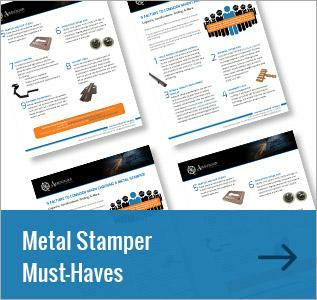 For more information on the design and production process at American Industrial Company, download our eBook, Understanding Metal Stamping: Design to Prototype to Production. In a continued effort to provide customers with the highest quality of products, American Industrial Company has added a top-of-line laser cutting system to our already extensive machine shop capabilities. The FiberCAB44 is one of the most advanced laser cutting systems on the market today. The FiberCAB44 system uses fiber optic technology to focus the laser beam, and offers increased energy efficiency and cutting speeds. Additionally, the FiberCAB44 offers even better precision and cleaner cut edges and tolerances as small as ±0.002”. The laser provides 3 kW of power and can cut through a variety of materials up to ¼” thick, including steel, stainless steel, and aluminum. The precision and speed of this system dramatically decrease lead times and reduce material scrap. The laser die cutting capabilities at American Industrial Company provide customers with efficiency and with low cost, high quality products. For more information on the benefits and capabilities of the FiberCAB44 system, download the eBook, The Benefits of Laser Cutting in Metal Stamping. Typical applications of our laser die cutting capabilities include: cutting sheet metal, flat blanks, formed parts, cutting blanks into precut strips for roll forming, and creating stencils and signs. American Industrial Company’s laser cutting capabilities serve a variety of industries, including food, appliance, automotive, construction, hardware, recreational, and many more. Examples of some of our custom laser cutting projects include: a spring steel stamped jaw assembly for the tooling industry, a metal stamped latch assembly for the power tool industry, and a shallow draw golf ball stencil for the recreational industry. At American Industrial Company, typical lead times are only 2-4 weeks. We also offer value-added services that include deburring, welding, plating, painting, and more. Our facility is ISO 9001:2008 certified, guaranteeing superior quality products. Contact American industrial Company today to learn more about our custom laser cutting and other exceptional services, or request a quote online.